Arrived in the harbor of the monastery of Symi at about 11:45. We visited the chapel which had all its vaulted ceilings painted in frescoes and many icons making up the alter area. The inner courtyard was of black and white stones making an intriguing pattern of zig-zag and geometric border. Later we went with the “Papa” through the rooms. One room was filled with ship models of great charm, ranging from complex and expert models to touchingly childish representations—all were gifts of various sailors to the monastery. In a more formal sitting room, which housed the previous relics of the monastery, we were served fig wine and Turkish delight while the Russells searched for their signature in the guest book relating to a previous trip. Finally, it was found and then each of us signed the current guest book. We returned to the Daphni and then had a refreshing swim and a delicious lunch. Later we water skied until about 6:00 p.m. At 6:30 p.m., we docked in the main harbor of the town of Symi. The town rises rather sedately up the slopes of a sharp and rocky mountainside and looks quite different from any we had seen to date. There was about it a European air. Formal facades with balconies of elaborate ironwork jutting from large shuttered doors and “French windows” were everywhere in view. The architectural detail gave one the sense of “townhouses” in contrast to the humble forms of the white “cute” houses we were accustomed to expect in these islands. After disembarking, we strolled along an active quay but realized that this was the only populated section. There appeared to be a preponderance of vacant buildings, left in disrepair, apparently abandoned. 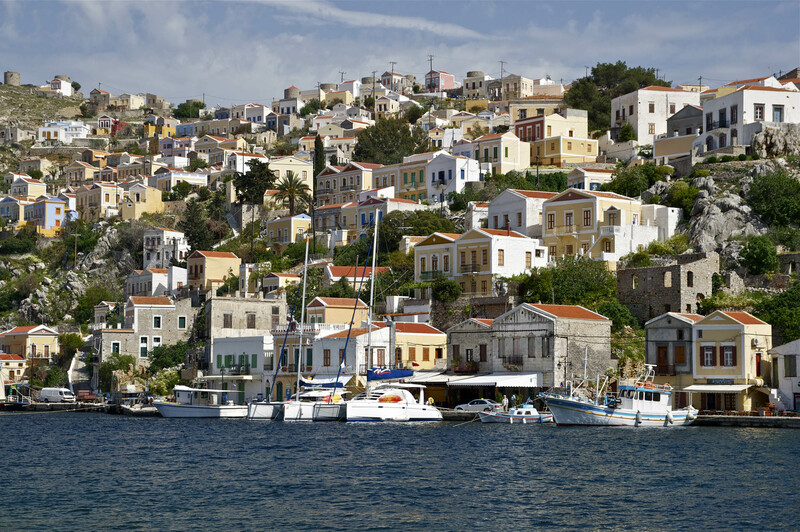 We inquired about this and found that the town of Symi was in the process of becoming a “ghost” town. The island is a “dry” island and does not exist on the produce of its lands. At the turn of the century, it had been most prosperous due to its high trade in sponges. In the days of their affluence, the inhabitants of this town-city had brought in fine furniture, objects and all sorts of material things from various parts of Europe and the Orient. In fact, all had to be brought to the island. All was traded: foodstuffs and all matter of things were imported. 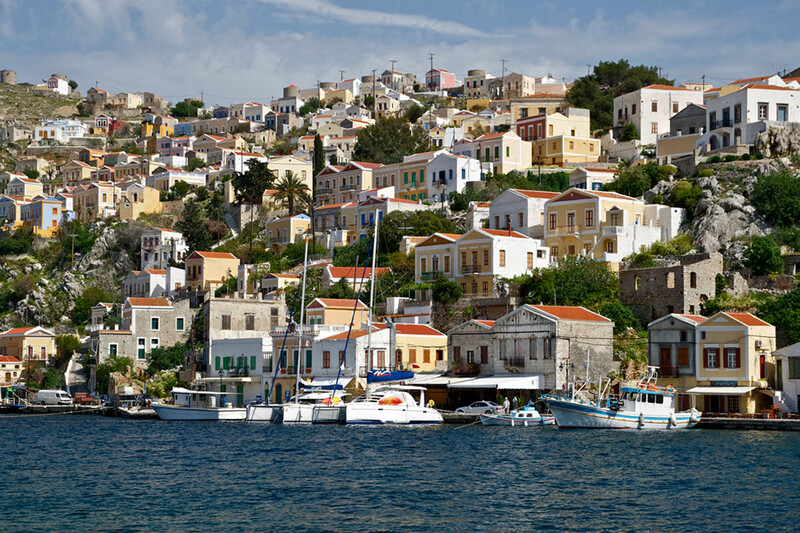 Recently, with the introduction of the nylon sponge, Symi’s sponge industry has been waning, now failing and the younger people have realized the hopelessness of their situation and have left Symi. Only some older people remain. Symi’s only hope of physical survival is to be discovered by the tourists; and if Mykanos is an example, this is a form of extinction too. As we walked in the moonlight we felt the small splendor of its past and became increasingly saddened by its failing condition. 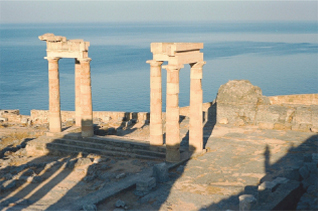 We could a little more clearly comprehend the frailty of places, cultures and even of civilizations. 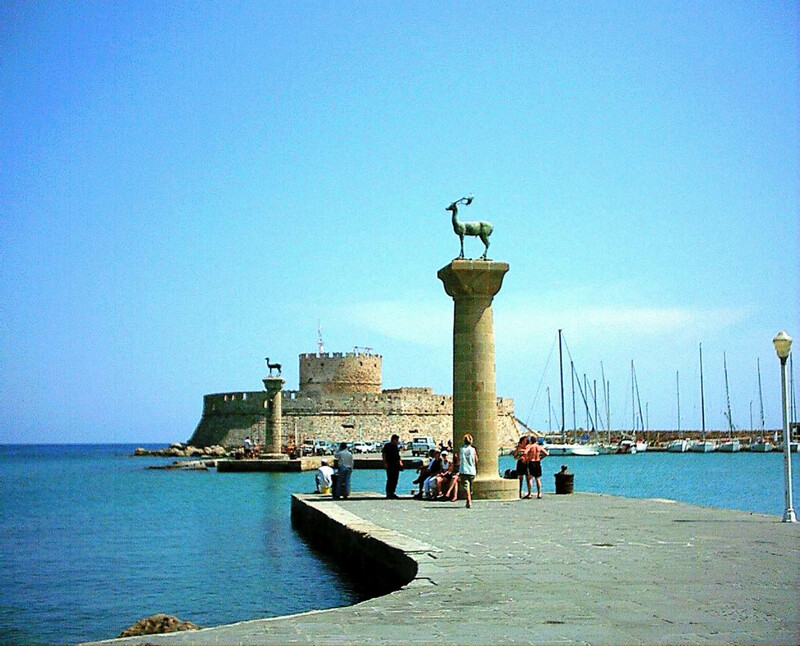 We arrived at Rhodes at about 10:30 a.m., a large and active harbor dominated by the battlements of the Knights of Rhodes. Many yachts were moored at the pier and flew flags from many countries. 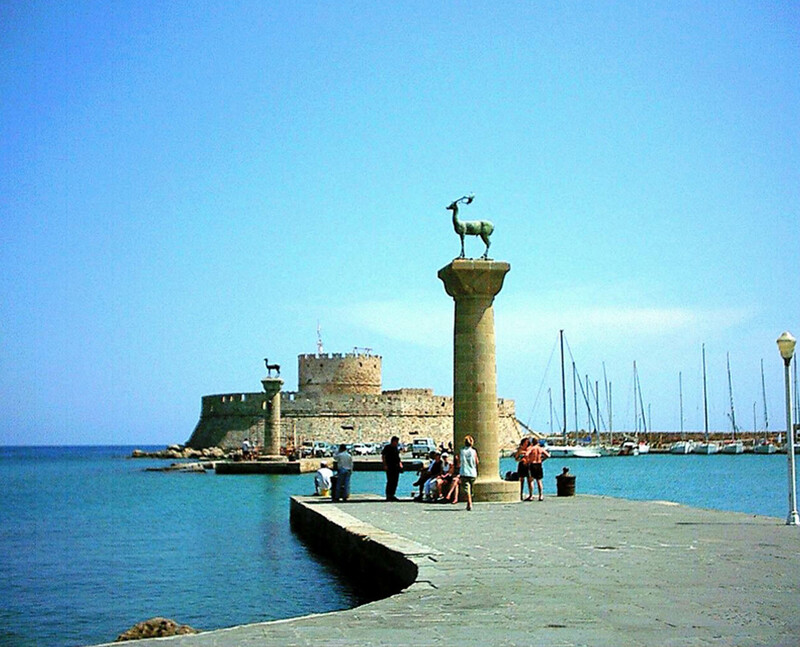 Rhodes is a “city.” It was bustling with traffic of cars, cafés, stores and people. We went directly to the museum, which has a formidably impressive exterior (circa, Knights of Rhodes). An extraordinary inner courtyard flanked on all sides by a two-story loggia constructed of massive arches and solemn pillars. 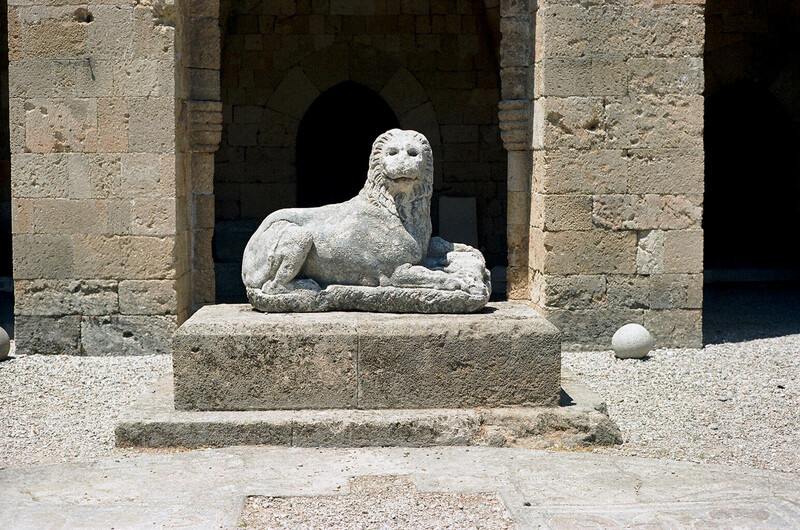 As one enters the central entrance archway, a monumental lion crouching on a massive base stares out imperiously. 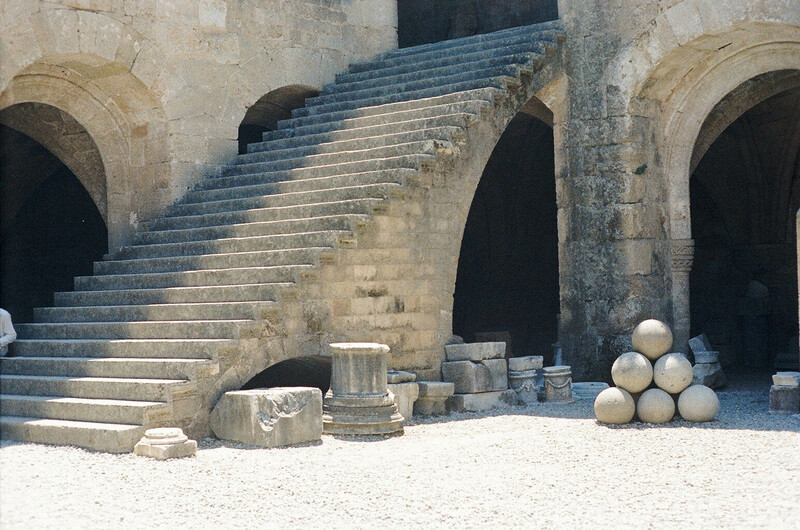 This sculpture is flanked by pyramids of stone balls (as if they were oversize cannon balls). The collection of the museum is rich in antiquities and medieval material. I was particularly impressed by a defaced standing Venus. I assumed its liquid formation was the result of wear. Perhaps it had been submerged in some secret place at the bottom of the Agean. Later I learned that it was titled the “Marine Venus.” Was this startling liquid quality an aspect of its original conception, “A Venus of the Sea,” or did this title refer to the place in which it was found? In the fragments of the antique it is thought there is an insistence of human presence in the core of the material. This is particularly true when its figuration is marred, defaced almost into intelligibility. There remains an expression of human vitality. There is a human “posture” in the gesture of these marble fragments. Though one can barely trace the memory of a figure, there remains, most vibrantly, the sense of a mind and heart that long ago touched this stone and brought it to singing life. Later that day we tramped endlessly through the “Turkish Bazaar” in the old section of the city. We were excitedly expecting to find “treasures.” To our disappointment, this section was a typical tourist shopping area not unlike the main street in Tijuana, Baja, California. 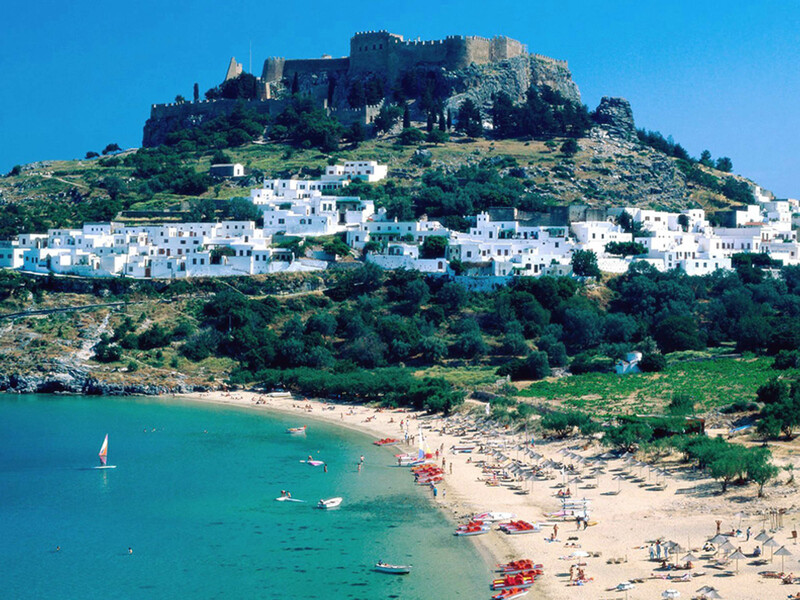 In spite of this, shirts, rings and dresses were purchased in Rhodes. Dinner splendid on the Daphni and then a pleasant stroll along the quay. Back on the Daphni a pleasant recounting of our day, good brandy for nearly all, ginger ale for me, and to sleep at 12:30 p.m.
We left Rhodes at 8:00 a.m. for Lindos. There were large swells and the Daphni pitched and rolled. Barbara and I sat on deck just aft of the dining room and chatted. The sea was deep blue with crisp white caps and spray was flowing from the crest of each curling wave. The atmosphere was clear but the air around us was spray filled. Gusts of wind washed down the deck with sheets of sea spray. Occasionally the bow of the Daphni would pitch into a large curling wave and the heavy spray of water would leap over her bow and land hissing on the aft deck. We were well protected and only our legs and feet would get wet. We followed a craggy coastline until at about 10:00 a.m.
We pulled into the lovely harbor of Lindos. Little white houses randomly showed themselves from behind patches of rich green plantings. The water was brilliantly clear and the dappled sea bottom shimmered below. We swam, water skied, lunched and napped. At about 5:00 p.m., when it had gotten cooler, we took the Daphni launch to the little pier on the shore. 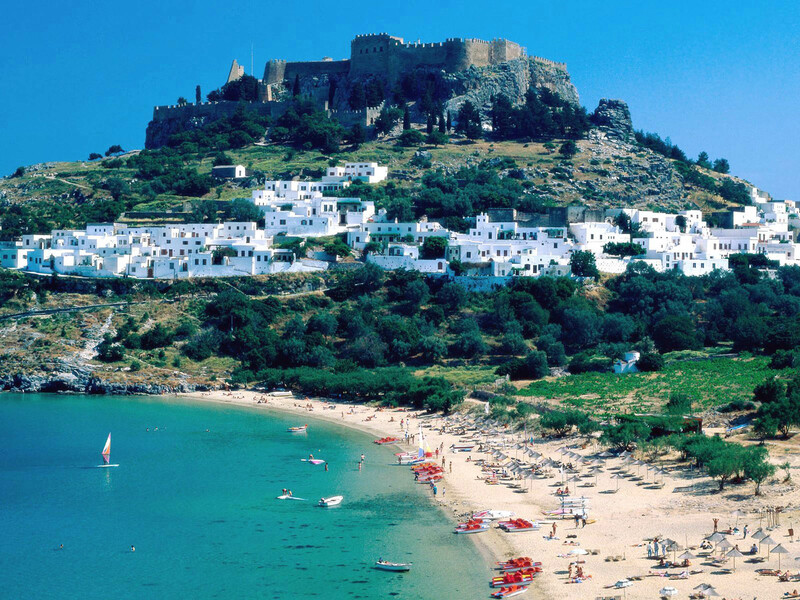 From the harbor, we could see the fortifications built by the Knights of Rhodes commanding the summit, and just slightly above at the highest plateau of the battlements the beautiful acropolis of Lindos. From the pier, we walked a few hundred yards to where we could mount donkeys for the steep climb to the acropolis. The donkey drivers, who make their entire living from this, are swarthy men and appear to be in exceptional physical condition. Under their straw brims, one can see a weather worn neck burnt by endless climbs in the blazing sun. They walk surely and rapidly and utter a constant chant of guttural sounds which evidently the little donkeys understand for their reaction to this is immediate. At the summit, we dismounted, walked up a long and steep stairway of the battlements and came to an arch that served as entrance. After purchasing our tickets, we went up further through a courtyard filled with fragments of pediment and large stones of the partially fallen battlements. Finally, we were at the top of the summit. An indescribably grand and varied panorama met the eye wherever it turned. Poised, as Sounion on the commanding mound, this site is more dramatic for it is higher and all is much grander in scale. 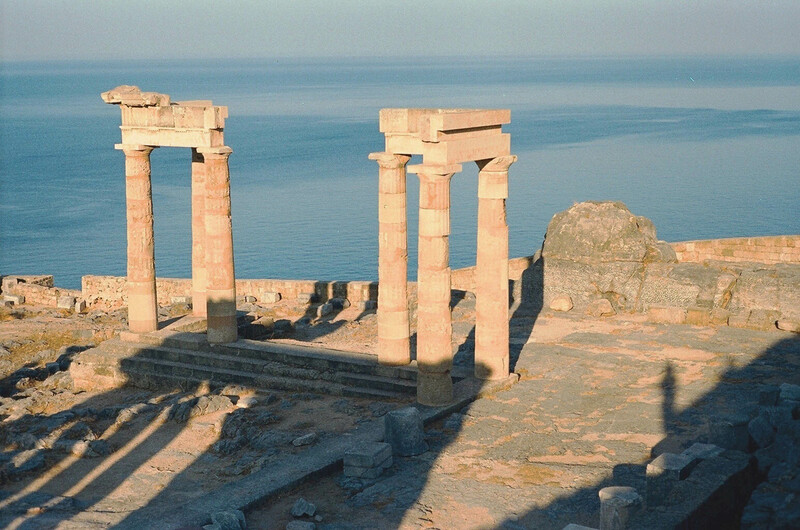 It does not have the special poetic charm of purity, simplicity and delicate grace of Sounion for Sounion is a heavenly body come down to earth.